One of the earliest projects in DKA’s long-running relationship with Mercedes-Benz was at Watford. 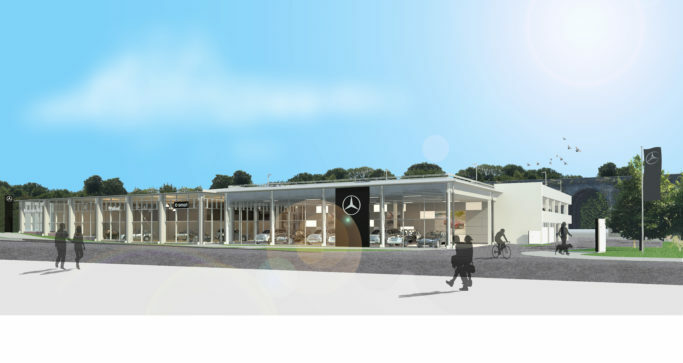 Nearly 20 years later we are still working on this site helping the client to make improvements, additions and maximise the efficiency of the site for this flagship dealership. As a case study, it demonstrates our ability to design within constraints, find innovative ways to help the business expand whilst giving its customers a consistent (and uninterrupted) high-quality service. The dealership has humble beginnings; it was formed from the retained structural shell of a former carpet warehouse. The retail units were converted and re-clad to form a showroom/ administration block and workshop. 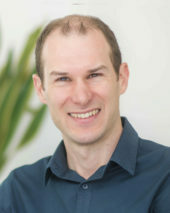 The surrounding site was used for car parking (customers and display), service parking, parts deliveries, valet and a myriad of associated back-of-house services. The large showroom has great visibility to the main road leading to Watford high street. The main elevations were designed with the contemporary corporate styling; external feature columns, a heavily regulated fenestration pattern and a common palette of corporate materials and colours. 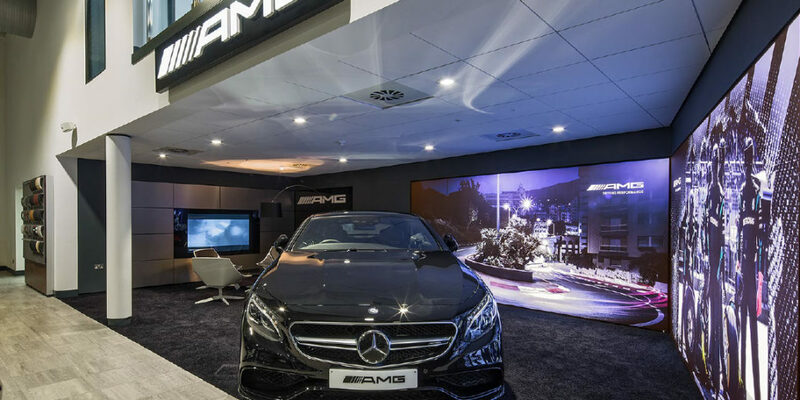 The customer experience was dominated by the arrival walkway, the entrance arch and a central ‘drum’ – common across all MB dealerships. The site proved extremely successful and quickly expanded to fill all available space. In 2015, DKA completed a large internal renovation to the mezzanine floor. The height of the drum was reduced to balustrade level and made into an open plan accounts office, alongside a new sales area with views to the showroom floor. 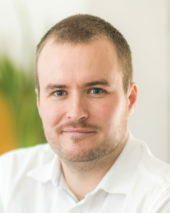 The former accounts space was reconfigured into a boardroom and managers’ cellular offices. The design had to successfully coordinate existing and new M&E, acoustic panels and refreshed corporate identity finishes. 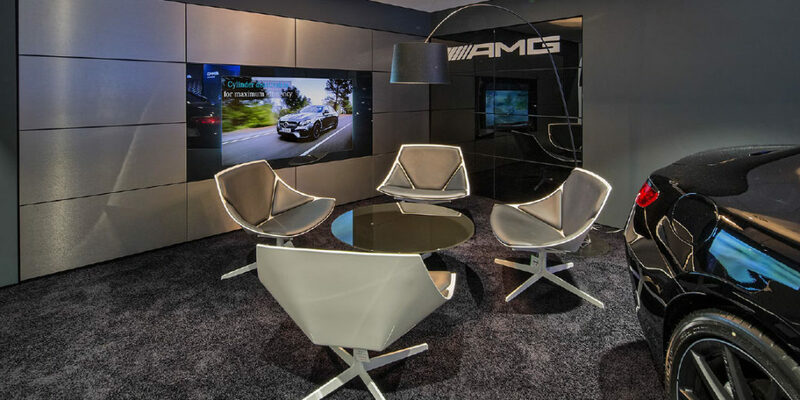 At showroom level, a new AMG display area was created for their premium brand. 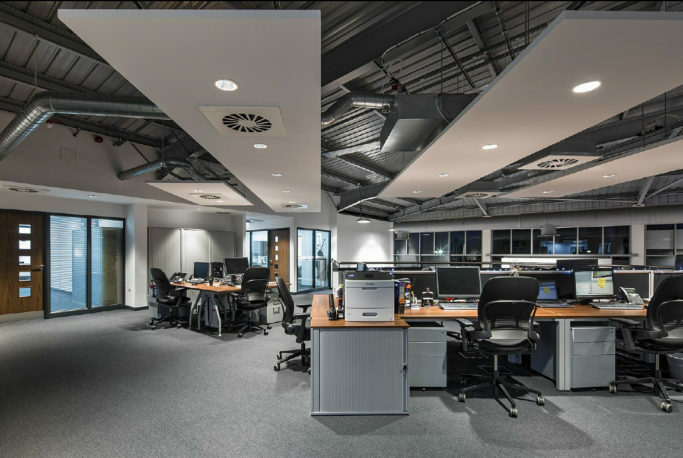 DKA coordinated the specialist install of feature wall panels and audio-visual equipment. A simultaneous design exercise sought to transform the external areas. 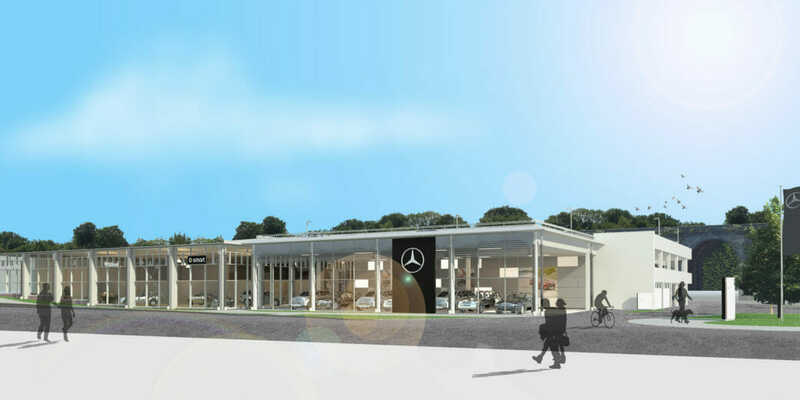 Planning permission was granted for a three-level decked car park to stand alongside the existing dealership. Customer parking remained at ground level, with two decks of service parking above. 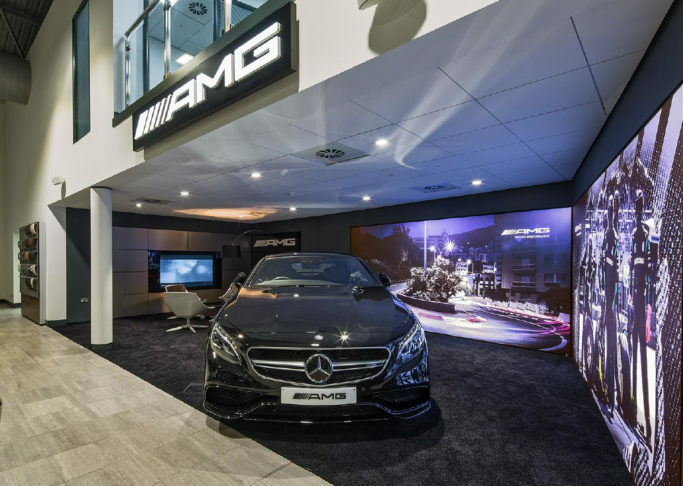 The car park is set back from the road and an innovative two-storey external showroom space has been designed which not only preserves external display space as part of the customer arrival, but also unifies the street elevation. 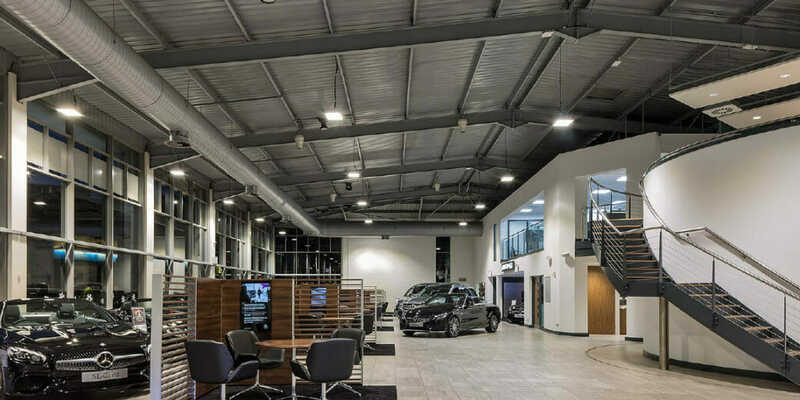 The external showroom has the benefit of being covered and uses a large display wall to screen the car park structure behind as well to animate the space with lighting, video screens and signage. The mezzanine project was completed at Christmas 2016 and the decked car park started on site late 2017. Both projects were constructed with the dealership remaining open throughout. This was achieved with a design that could be constructed in phases with building elements appropriate for the limited storage areas on site; the mezzanine refurbishment had to bring all materials up and down one back staircase. Combined with excellent on-site management between the main contractors and dealership managers, the works were constructed safely limiting any conflicts between customers and construction works. 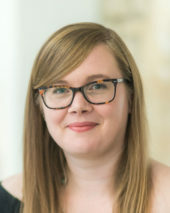 DKA are proud to have a long history with this site and despite the considerable constraints, we enjoy the challenge of designing ways to help the managers, staff and customers enjoy the best possible experience. Our design interventions have made a great impact on the dealership, learning key lessons that can be translated onto other projects. A time lapse video of the eight month construction of the car park can be viewed below. Courtesy of Ashe Construction.